What Holiday Treat Should You Stress Bake/Eat? It’s the most stre-e-essful time of the year! Let’s face it: the Hallmark movies they’ve been showing since Halloween don’t depict the real end-of-the-year hustle no matter who you are, whether you’re a high school senior trying to finish your college applications before the end of the year or a college student with finals beating down the door. Even if you have everything under control, there’s the stress of traveling, family gatherings, shopping, decorating, entertaining, and all those holiday parties you have to attend! Luckily, December is prime treat season. Now’s the time to stress-eat or, even better, stress-bake. Stress-baking, especially to share with others, has actual psychological benefits associated with it, according to science. So take an application/study break, pull out the baking sheets and cookie cutters, and whip up one (or all) of these stress-beating snacks! If you’ve got your Common App filled out and all you need to do is finish those pesky supplemental questions and essays, you’ve earned yourself a decent break—which means you have time to put into baking some delicious gingerbread cookies or sufganiyot. 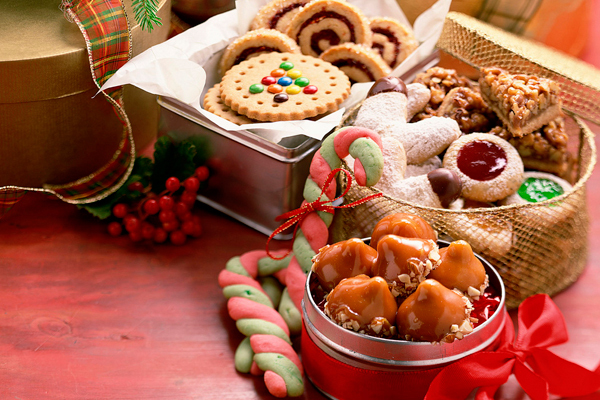 Depending on how well you’ve budgeted your time, you can donate more or less time to your cookie-making break. You can use store-bought dough that’s premixed or the kind you just need to add eggs and water to; you can make your own dough but limit your decorating to the bare minimum or not at all; or you can go all out and make the dough and frosting yourself and decorate each cookie with individual detail (if you really need to procrastinate take a break). What’s great about gingerbread is that you should let the dough rest for a little bit, and watching an oven is no fun, so you can work on your apps during those times. Just don’t forget to set a timer! With exams, you probably just want to step away from everything for a few days, or better yet, just not take them at all. While this seems like a great idea, it’s not really that possible. You’re better off to take a short break to make a quick fudge or some candy. A lot of fudges are pretty easy to make and aren’t that time consuming. You have to give them time to cool before eating, but let that be your incentive to study hard or finish your essay in a timely fashion and reward yourself with decadent fudgy goodness. And all you need for a lot of fudge is a microwave, a microwave-safe bowl, and a pan to put it in! You can find some simple fudge recipes here and here. There are also a lot of candy options. Again, these tend to require setting or cooling times, but that allows you to schedule different breaks in your studying. From a holiday twist on classic muddy buddies to homemade gelt to microwave-made candy, there are plenty of easy candy recipes floating around. If you’re super nice and your class is on the smaller side (not a 100+ person lecture of course! ), you might consider bringing some to your final for your classmates. Unless there’s none left of course! This is for the Golden Students who submitted their college applications early and are cool as a cucumber about exams. This time of year can still be anxiety inducing with all the pressure surrounding the holidays, plus Seasonal Affective Disorder (SAD) setting in for some people. You might need a little pick-me-up, and making food can be great stress relief. That’s why it’s called stress-baking! Since you don’t have to worry about being crunched for time, bake something delicious that will force you to focus on it for a while. Try making pie or maybe some truffles. When it comes to pie, the prep time is long, but the payoff is big. And there are so many different types of seasonal pies you can make, from an old-fashioned pecan or apple pie to something less traditional like eggnog or cookie—warning: the literal best thing you’ll ever eat!—pie. If you’re really bored (and creative), you can get fancy with the crusts. Truffles are delicious, addictive, and typically easy to make. However, they are a time commitment. They typically take at least an hour just to chocolate-coat them. But if you’ve ever had truffles, you know they’re worth it. You can find some recipes here and here. And remember, if you don’t like baking, store-bought works just fine. Enjoy! Related: Find easy recipes for your microwave on the CollegeXpress YouTube channel!